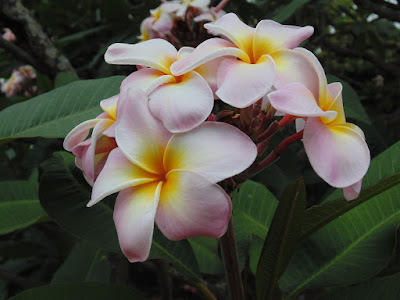 Time to end the week and our look at Moanalua Botanical Gardens with this plumeria flower. This is a fairly common plant in Hawaii and used to make a lot of the flower lei seen on the islands. If you want check out Moanalua Botanical Gardens this weekend is a great time as it holds the 38th Annual Prince Lot Hula Festival. This free hula festival runs on July 18 and July 19, 2015. You can in the shade of some trees and watch hula performances and also tour the gardens. 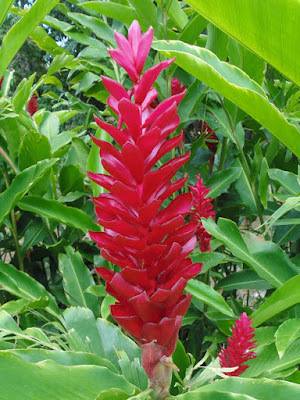 While strolling through Moanalua Botanical Gardens there were a lot of red ginger flowers in bloom. I wandered around looking for the most photogenic of the flowers and here is what I came up with. I love the red and green contrast. 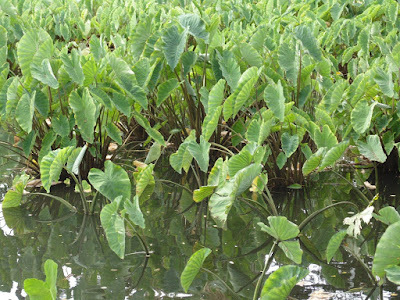 At Moanalua Gardens sits this nice taro pond. Complete with taro plants, koi and ducks. Taro is a native Hawaiian cuisine staple and today you can se it in poi, taro chips, taro bread and even one of my favorite taro malasadas.